Chris Draft, 34, is every bit a football player -- from his emphasis on physical fitness to his ease in recalling the win-loss record of any given team, any given year. But by all accounts he's one of the sport's outstanding men, too. 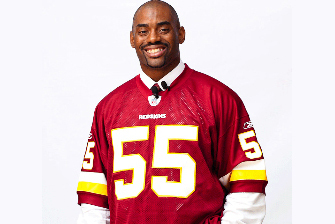 The recently signed Washington Redskins linebacker brings with him to D.C. the work of his Chris Draft Family Foundation, partnering with nonprofits and schools to promote education and self-discipline. He spoke with The Washington Examiner about what inspires his work, and what it takes to achieve. I am a Christian -- a Baptist Christian. The faith, for me, is about a constant striving not for a perfection of material wealth, but for a perfection of manhood. It's a lifelong journey of self-assessment, and self-improvement. Did anyone or any event especially influence your faith, or your path in life? My battle with asthma has helped. It's made it so that every day matters, every day counts a little more. There are always positives and negatives -- I have to make sure I'm taking my meds, and that I avoid triggers like smokers and allergens. But the positive is that it really does make me wake up in the morning and take a deep breath and be thankful, and be intentional about what I'll accomplish that day. I would credit my parents, too, and how they really challenged my brother and me not just to play sports on our own terms, but to be a teammate that people could count on. And from the beginning, from the time I was four years old, they made it very clear that if I was going to play any sport, it didn't matter how good or bad I was, but that I was going to give it my best. That would be their question: "Did you give it your best?" We hear all the time that it takes hard work to achieve our dreams, whatever they are. What has that actually meant for you, day to day? I can tell you it's a great feeling when you really know that you've spent all of your energy on one thing, and have focused completely on your goal. But I would say, too, that you need people pushing you. One of the most important things is to be coachable, and then challenging that coach to push you a little more. And you have to be smart about it -- just working hard is not always the best answer. You have to be smart in the way that you do the work, and you need someone around to ask questions to -- someone to ask, "How can I do this better?" What responsibility, if any, do teams have to ensure players are good role models? Everyone is a role model. And I think it's kind of disappointing that all of a sudden, when a person becomes an NFL player, that's when we expect a role model -- instead of expecting it of everyone. It's a function of two things: First, whether your influence is positive or negative, and second, how big is your sphere of influence. As a third grader, you're a role model to the kids sitting around you. As a high school student, as a college student, you're a role model. When you get to the pros, the only difference is the size of your sphere of influence. We've got a lot of young guys in the NFL still trying to find their way. People tell them, "you're a role model," and yeah, they're role models, but they're no different than anyone else. It's a lot of weight to carry. It's up to us, but it's up to the community, too. Hopefully, we can provide backup to what the community values, but it takes the whole community. Nothing stops the man who desires to achieve -- that's a quote I try to live by. And it's about making a choice, committing to that choice, and then being excited about it. Don't be on the fence. There'll be hard times, there'll be ups and downs, but take the journey and enjoy it. Then, take a hard look at yourself, and ask, "How can I do a little better next time?"